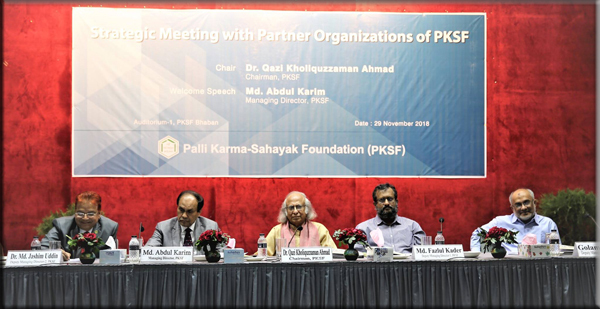 Palli Karma-Sahayak Foundation (PKSF) organized a meeting titled ‘Strategic Meeting with Partner Organizations of PKSF’. 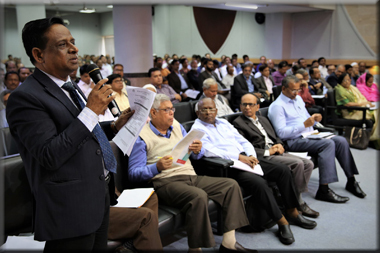 This was the first of its kind that took place to exchange views with all who realize at the field-level what the Board and Management of PKSF conceive at the decision-making level. 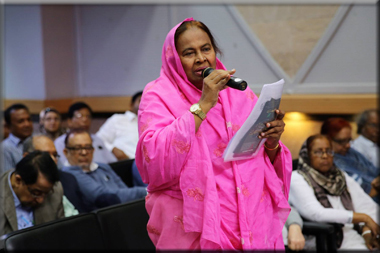 The meeting was held on 29 November 2018 at PKSF Bhaban. 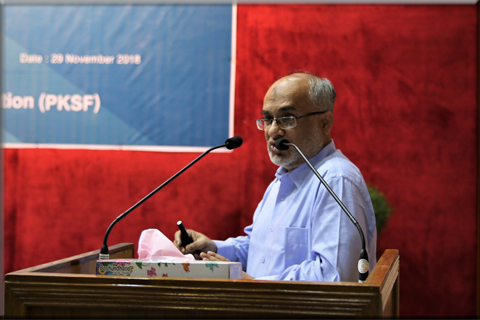 PKSF Chairman Dr Qazi Kholiquzzaman Ahmad presided over the meeting while PKSF Managing Director Mr Md Abdul Karim delivered the welcome remarks. Highlighting the rapid expansion of the activities of PKSF and its POs, PKSF Chairman Dr QK Ahmad focused on efficient program management including finance to ensure sustainable development of the poor. He also emphasized on adopting new programs to achieve Sustainable Development Goals (SDGs). 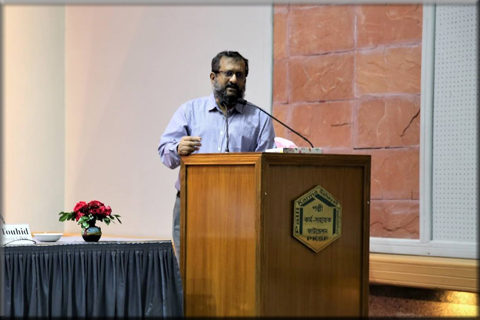 In this regard, he referred to the ENRICH program of PKSF that seeks to ensure human dignity for all through inclusive and sustainable development. He hoped that PKSF and its POs will work more diligently in future. 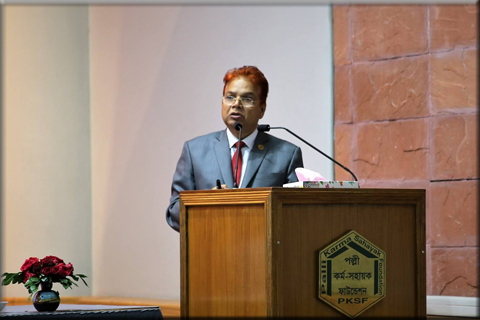 Mr Md Abdul Karim, MD of PKSF, in his welcome speech, said that the responsibilities of the POs are increasing with the expansion of their activities. 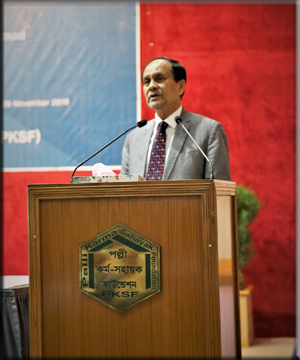 He also made a presentation on ‘Three Decades of PKSF’s Journey: The Paradigm Shift’. In the presentation, Mr Karim demonstrated the diversification of the activities of PKSF. 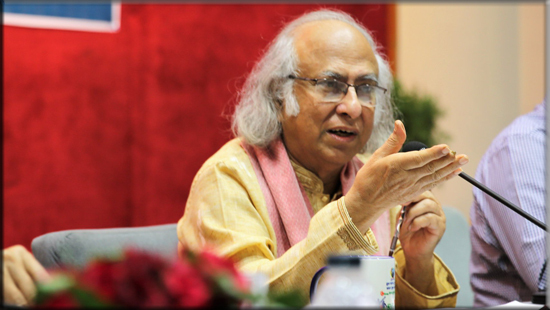 Moreover, he also referred to PKSF’s journey from a microfinance organization to a human-centered development organization. 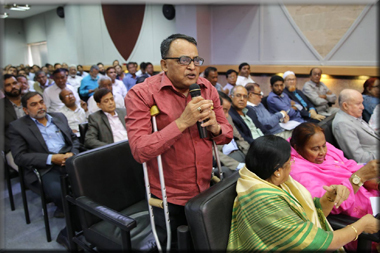 In the meeting, the three PKSF Deputy Managing Directors gave three presentations — Mr Md Fazlul Kader on ‘Scaling up Economic Activities’, Dr Md Jashim Uddin on ‘Good Governance’, and Mr Golam Touhid on ‘Capacity Building’. Different issues were discussed in the meeting to make the development programs of PKSF more dynamic and effective to ensure sustainable development human dignity for all. Representatives of the POs of PKSF also gave important feedback on PKSF activities and the challenges ways out to implement them in the field.